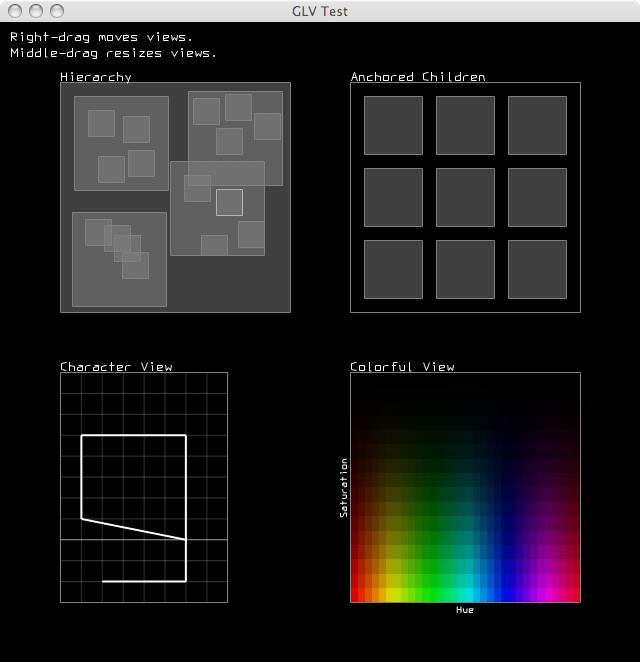 GLV (Graphics Library of Views) is a GUI building toolkit written in C++ for Linux, OSX, and Win32. GLV is specifically designed for creating interfaces to real-time, multimedia applications using hardware accelerated graphics. GLV is designed to be lightweight and modular so as to make it easy to integrate with existing projects. Its only dependency is OpenGL. Although windowing is technically not a part of GLV, it does provide an abstraction layer for creating bindings to a particular windowing system for creating an OpenGL context and getting mouse and keyboard input. A binding to GLUT is currently provided. GLV observes a very minimal rectilinear design. Not only does this result in a straightforward presentation, but also optimizes many aspects of the underlying rendering system, such as number of vertices used, hit detection, and view cropping, making it run more efficiently. The main View class provides a common interface that all other widgets inherit from. There is no concept of "leaf" or "composite" views, as typically seen in other GUI toolkits, making the API easier to learn and extend. A unique feature of Views is that they support both early- and late-bound event handlers. Furthermore, each View can contain multiple late-bound event handlers per event type. This provides a general model for extending the behavior of Views, such as adding mouse-controlled translation or resizing to any View. Obtain the latest source code from the GLV GitHub page. Copyright (C) 2006-2008. The Regents of the University of California (REGENTS). appear in all copies, modifications, and distributions. Rect is a geometry base class that all Views inherit from. It represents a rectangular object with data members to describe its position and extent in pixels. Its position is stored as the coordinate of its top-left corner on a cartesian grid with positive x going right and positive y going down. Rect has methods for changing its position and extent and multiple methods for getting its right edge, bottom edge, center points, area. There is also a method to determine whether the Rect contains an x-y coordinate. This can be used, for instance, to check if a Rect has been clicked on in the window. A View is a Rect that has one or more drawing routines and event handlers, and properties for being a node in a tree of Views. Every View has a virtual onDraw() method that gets called every frame. This method contains the View's specific OpenGL commands to display it on screen. A View contains four View references, parent, child, left sibling, and right sibling, that enable it to be a node in a tree structure. This is the main basis for how Views are organized spatially and behaviorally within a top-level View. Views are rendered by traversing the View tree pre-order calling each View's onDraw() method, starting at the root (window) View. This means that the root View's onDraw() gets called first, then, recursively, the children followed by their siblings. The << operator adds its right operand as a child to the left operand. The operator returns the parent View, so that multiple children can easily be added using method chaining. A View can also reposition or resize itself automatically when its parent resizes. These capabilities are controlled through its anchor() and stretch() methods. In the most general case, anchor and stretch factors can be specified in each dimension as floating-point values between 0 and 1. The factors determine how much of the parent's resize amount is added to the view's position and extent. The following figures illustrate how a child view (C) behaves when its parent (P) is resized by dx and dy. Place is an enumeration namespace for specifying specific points on a rectangle. The defined types are TL, TC, TR, CL, CC, CR, BL, BC, BR where T = top, B = bottom, L = left, R = right, and C = center. These are primarily used for positioning views and specifying parent anchoring points. Direction is an enumeration namespace for specifying a direction. The defined types are N, E, S, and W. The convention used in GLV is that north points to the top of the screen and east to the right of the screen. Directions are used primarily for specifying the placement flow of layout managers. HSV also has a special constructor to allow a short-hand method of getting a color's HSV values. Virtual methods can be overridden by subclasses to customize their behavior. The following example shows skeletal code for a View subclass defining its own callbacks. A View also has a single pointer to a drawCallback type and a map of eventCallback lists. A View's function pointer type callbacks are called after its virtual callbacks. The event callbacks are special in that one or more can be added per event type. View has an overloaded, chainable function operator defined to simplify appending event callbacks. The GLV class acts as a top-level View as well as a bridge to a windowing system. This class handles the drawing of the View hierarchy and distributes mouse and keyboard events from the window to its descendents. A GLV class is usually constructed with a static drawing callback. The GLV class contains objects with the current keyboard and mouse state that can be accessed from event and drawing callbacks. This is a class used to store the current state of the keyboard. The state includes the key code of the last key pressed, whether it was pressed or released, and the state of modifier keys shift, control, and alt. This is a class used to store the current state of the mouse. The state includes its buttons' state, coordinates relative to the window, coordinates relative to its listener, coordinates relative to the window when each button was pressed, mouse wheel position, and velocity and acceleration in the x and y directions. // Notify the label whenever the slider value is updated. The Application class is responsible for starting the main application event loop. Application::run() is called after setting up the GUI code. The drawing namespace, draw::, consists of a minimal wrapper around the OpenGL API, shape drawing routines, and vector-based text rendering. The following functionalities exist only for convienence, as direct OpenGL calls can still be used, e.g., when creating custom widgets. The following example shows how rendering commands would be used to draw a 3D scene in a View's onDraw() method. The following are images/names of the currently implemented symbols. The draw:: namespace also has a function for rendering simple text to the screen. The text renderer uses an internal fixed-width vector font with each character defined on an 8x11 unit grid. The cap lies at 0 units and the baseline at 8 units. In general, characters are rendered with the minimal number of vertices that does not sacrifice their readability and distinction from others. The text rendering mechanism is not meant to be comprehensive, but to be quick and easy without requiring dependencies on external libraries or font files. In this example, the text is drawn with its left edge at 0 and letter cap at 0. Text strings with new lines, \n, and tabs, \t, are also handled properly by the renderer. A Button is a widget that has two possible states- on or off. By default, a Button is toggleable meaning that its state changes when it is clicked on. A Button can also be made non-toggleable so that it becomes active on a MouseDown event and inactive on a MouseUp event. Button has two drawing function pointers for specifying which graphical symbols to use for on and off states. The Buttons widget is an extremely flexible N x M button array. It can be used to create menus, radio buttons, and button matrices, for example. Buttons can be either in mutually exclusive mode or not. When in mutually exclusive mode, only one button can be on at a time. Otherwise, any number of buttons can be on or off at a time. ColorPicker permits selection of a single color from HSV space. The top bar is a slider for selecting hue while the bottom panel is a 2D slider for choosing saturation (x-axis) and value (y-axis). DropDown is a no-frills drop-down menu of text strings. Items can be selected using either mouse or keyboard interaction. Label is a text string that is typically attached as a child to another view. By default, Labels do not render a background or border allowing them to 'float' on top of other views. Hit testing is also disabled by default preventing them from stealing focus from a parent view. Labels can also be specified to render vertically which can be useful for notating the y-axis of graphs. ListView allows selection of a text string from a set of strings arranged on an N x M grid. It can be used, for instance, as a single column menu (see DropDown) or a radio selector. NumberDialer(s) allows one to treat each digit of a number as a dial. The number of digits in the integer and fractional parts is specified upon construction. NumberDialer(s) can also be specified to have a minimum or maximum value. The default extrema are the largest displayable values. When a digit is dragged up or down with the mouse, the number is incremented or decremented by an amount proportional to the place of the digit. The currently selected digit (indicated by a lightly colored box) can also be modified through the number keys on the keyboard. The sign of the number can be toggled by clicking it or by pressing the '-' key. Plot permits graphing of data in one or two dimensions. To each Plot can be attached one or more Plottables for presenting data in a particular way. The provided Plottables are PlotFunction1D, PlotFunction2D, and PlotDensity. The Slider widget allows one to change a value by sliding a bar across the screen. Depending on its dimensions, the slider will automatically be displayed as vertical (w < h) or horizontal (w >= h). The slider value is 0 at the left or bottom edge and 1 at the top or right edge. In its signed mode, the value is -1 at the left or bottom edge. Clicking on the slider with the left mouse button will set its absolute position. Dragging with the left or right mouse button will increment the slider's value. Normally, the amount the slider moves is in a one-to-one correspondence to the mouse cursor position. However, if both mouse buttons are held while dragging, the slider is incremented by a quarter of the distance the mouse moves. The SliderRange widget allows one to control the minimum and maximum values of an interval. The entire interval can be translated by dragging the bar. Clicking and dragging near the ends of the bar changes the associated extremum. Clicking on a blank region causes the whole interval to translate in the direction of the click. Slider2D is used to control two numeric values simultaneously, such as an x-y position. A knob indicates the current values of the slider. The slider values are 0 at the left or bottom edge and 1 at the top or right edge. Mouse interaction along each axis of Slider2D is the same as with the Slider widget. The Sliders widget is a group of several Sliders. In general, it will be easier and more efficient to control a set of values using a single Sliders widget rather than multiple Slider widgets. The sliders can be displayed either horizontally or vertically. 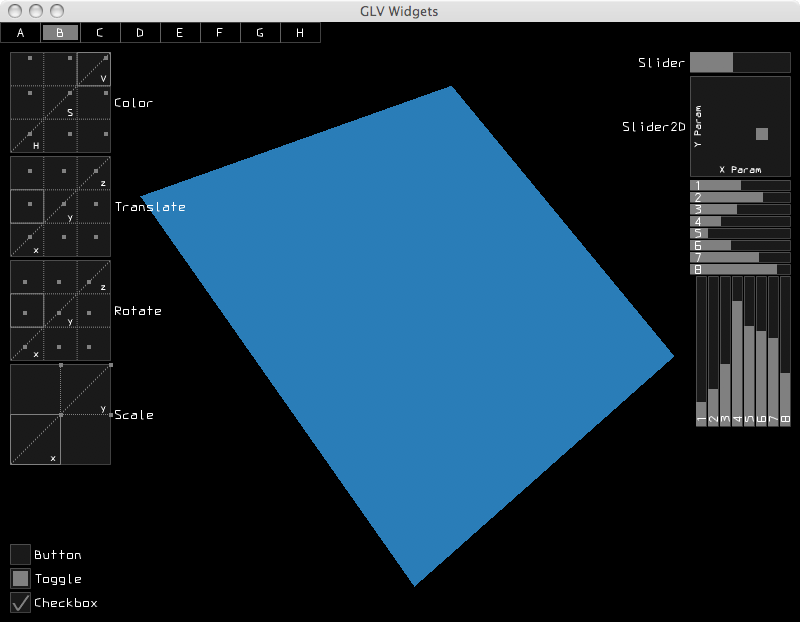 It also supports a special drag set mode where sliders can be set by dragging across the widget as if drawing a curve. Mouse interaction with individual sliders is the same as the Slider widget. SliderGrid is used to control two or more parameters either alone or in pairs. Each cell in the grid represents one permutation of parameter pairs. The pairs are controlled just like in Slider2D, with the exception of the cells along the diagonal. The diagonal cells allow exclusive control over individual parameters. The parameters are layed out on the grid with the first parameter at the bottom-left and the last parameter at the top-right. Within each cell, the slider values are 0 at the left or bottom edge and 1 at the top or right edge. Mouse interaction within cells is the same as with the Slider2D widget. TextView is a simple single-line text entry box. Character input can be filtered according to a custom function. For convenience, a numeric filter is provided. Notifications can be sent when the text string changes and when the 'enter' or 'return' key is pressed. View3D allows a 3D scene to be rendered within a View. Custom drawing code is implemented by subclassing View3D and overriding the virtual onDraw3D() method. View3D has options for setting the near and far clipping planes and the field of view angle in the y direction. By default, depth testing is enabled and blending is disabled. Placer is used to position a sequence of elements relative to each other, at absolute positions, or a combination of both. Placer holds relative increment factors and absolute increment amounts for both the x and y directions, thus making it an extremely flexible layout positioner. In the simplest case, elements can be arranged so that their absolute positions are a fixed distance apart. This is done by using relative increment factors of zero and absolute increment amounts equal to the distance. Another use of Placer is to position a sequence of views with a fixed amount of padding between them. In this case, the relative increment factor is set to 1, while the absolute increment is set to the desired padding amount. The following example positions elements going east with a padding of 1. In the previous example, the alignment was set to the top-left corner. By setting the alignment property of Placer, views can be aligned from different places. 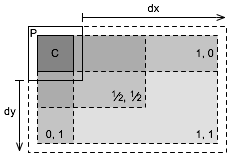 Table is used for doing general rectangular layouts on an N x M dimensional grid. 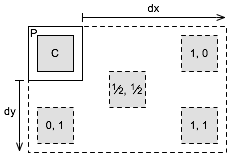 A 2D arrangement string is used to specify how views will be arranged when added to the table, starting from the top-left corner and going left-to-right, top-to-bottom. The arrangement string consists of single character codes that specify either existence of elements and their alignments or table cell structure (i.e. spanning, dimensions). The arrangement string makes it easy to specify complex layouts. The string can be written in a two-dimensional fashion to give a one-to-one visualization of the arrangement. "| x | . " If the arrangement string is shorter than the number of views added, then it will be repeated. This feature can be used to define a layout pattern using only a single row specification.